Mirjan fort: The fort known for its architectural elegance was the location of several battles in the past under Vijayanagar Empire. The fort is built by Queen Chennabhairadevi of Gersoppa, in 16th century, who ruled for 54 years and lived in the fort. Since the district was a main trade center of spices (pepper, saltpeter, betel nut etc.) and pepper exported after the arrival of Portuguese, queen was honored by the name “The Pepper Queen” of Gerusoppa. Jain Basadi: Gerusoppa is a popular Jain Heritage Centre that flourished as a chief Jain center for about 400 years (13th-16th century). It was the capital of the SaluvaKings for a considerable period and also ruled by Vijayanagara kings. Chaturmukhamantapa is the architectural attraction of the temple, which is surrounded by lush green Sharavati river valley. Om beach, Gokarna: Om beach is one of most splendid beaches in the country, which is located about 8km from Gokarna town. Natural geography of the beach resembles letter “Om, ॐ (hence the name), which attracts lacks of people every year from all over the world. 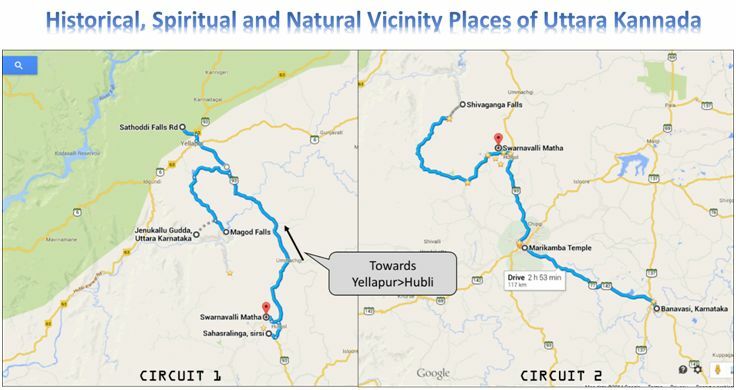 Some of the other specular places in the town includes Kudle beach, Mahabaleshwara temple, Halfmoon beach, Kotiteertha etc. Sharavati valley: Sharavati is one of the longest river of in the central Western Ghat region, which flows through the dense evergreen and semi-evergreen forest and creates numerous waterfalls on her way with breath taking Jog falls at Joga (near Gerusoppa). This valley shelters abundant flora and fauna of Western Ghats where the hushed beauty of nature makes us to experience eternal bliss. Dhareshwara beach: A less crowded beach, located adjacent to the NH 17 on the way to Honnavar from Kumta. A long quiet beach, where fishers are patiently waiting and working, where the splendorous sunset can be enjoyed to the fullest. Apsarakonda beach: One other beautiful unique beach located about 8km from Honnavar town, which has wall like rocky hill on the other side. The garden on the hill with lots of clourful flowers and blossoms makes the place more spectacular. A small waterfall and a temple are the other attraction very close to the beach, which makes the visit memorable. 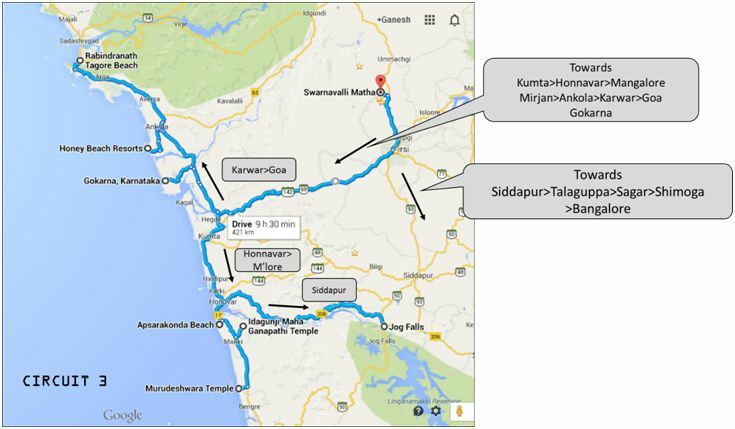 Murudeshwara temple and beach: Murudeshwara is located in Bhatkal taluk, close to NH 17, towards Mangalore. The famous world’s 2nd tallest Shiva statue, a 20 storied Gopurafacing statue and the Arabian Sea cost (rocky beach) can certainly relish one’s eyes and the mind. Jenukallu Gudda: It is one of the most beautiful peaks in the Western Ghats which is located about 17km from Yellapur town. Lavish green cover, misty mornings, fresh breeze and tranquility of Bedti river valley astonish us and charges with positive energy. The place resides in the core dense evergreen forest, which hub of biodiversity where countless creature from microorganisms to big cats and giant trees live in harmony. 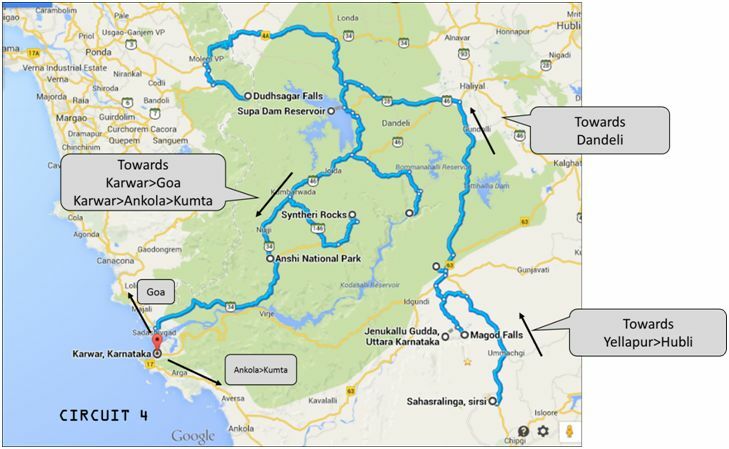 River Kali and its valley: Kali is the longest river in the district, supports the livelihood of 4 lakh people in the state before it joins Arabian Sea near Karwar. River flows in core Western Ghat region, which is dammed at Supa, known as Supa dam, for electricity generation. Vigorous flow of the river facilitated water games like river rafting etc. Many jungle resorts are also available to enjoy the misty mornings of Kali river banks and the forest stay. Madhukeshwara temple, Banavasi: Banavasialso known as Konkanapura is an ancient temple town in Uttara Kannada District, located about 26km from Sirsi town. The town is located on the bank of river Varada, once was the capital of Kadamba rulers, an ancient royal dynasty of Karnataka. The temple of lord Shiva, has fine architectural carvings and is a famous religious place in the state. 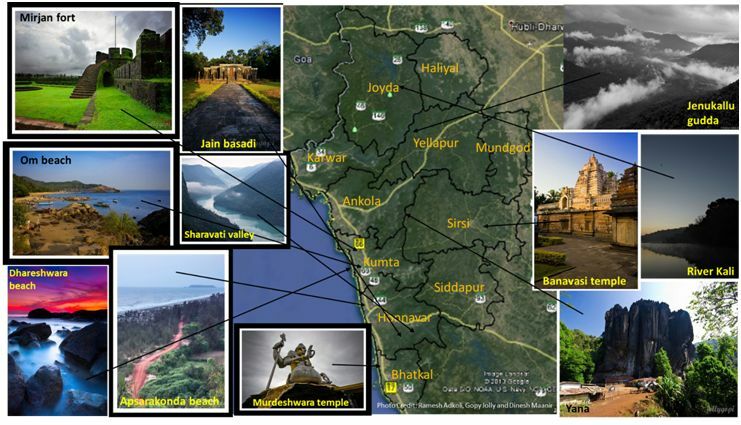 Yana: It is located in the Sahyadri mountain range of the Western Ghats, about 60 km from Karwar, 40 km from Sirsi and 20km from Kumta. Two unique massive rock structures namely, Bhairaveshwara (120m) and Mohini (90m) with a temple of Lord Shiva (cave temple) makes the place religiously important and exquisite. Magod falls: It is an incredible creation of Bedti River, where water gushes down into two steps from about 200m which is located 19km from Yellapur town. The water fall is surrounded by thick green forest where the foggy weather peasants the mind. Sathoddi falls: Several streams spout through a rock and a beautiful formation take palce; Sathoddi falls, located near KallaramaraneGhat, near Sirsi, and 32 km from Yellapur. Water flow I not harsh in the downstream which give adequate space to enjoy, which is the specialty of this waterfall. Jog falls: A world famous creation of river Sharavati at Jog, is one such amazing water fall, which enriches ecstatic bliss within us. The mighty Jog falls is located in the border of Utara Kannda and Shimoga, about 30km from Honnavar town. It is the 2nd highest plunge of water in the country, where 4 streams fall from a height of 253m attracts millions of people around the world. 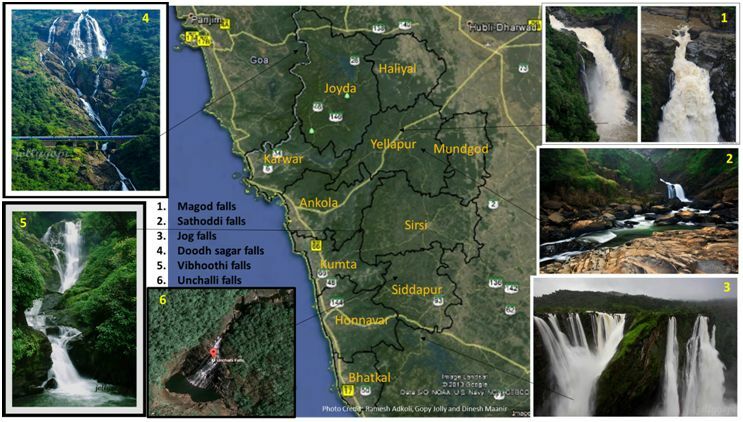 Doodh Sagar falls: Doodh Sagar, “Sea of Milk”, is another natural marvel in Western Ghats, created by Mandovi river, located in the Goa border of Uttara Kannada district (Joyda taluk), Karnataka. The cascading waterfall (310m) is covered by dense vegetation, through which the Konkan railway passes, which is said to be one of the beautiful train routes in the country. Vibhooti falls: After walking about 2 km in dense evergreen foresta fabulous waterfall welcomes with its zig-zag flow called Vibhooti near Yana, about 50kms from Sirsi, Western Ghats. It is an enjoyable place for swimmers, trekkers and all others, where the water flow is calm and gentle. Unchalli falls: Unchalli Falls, also called Lushington Falls, is a waterfall created by a 116m drop in the Aghanashini River located in Siddapura, Uttara Kannada District. It spreads over a vast area during monsoon, when it is in full bloom and fall of water is quite even during the full flow of the river is a bizarre natural creation.